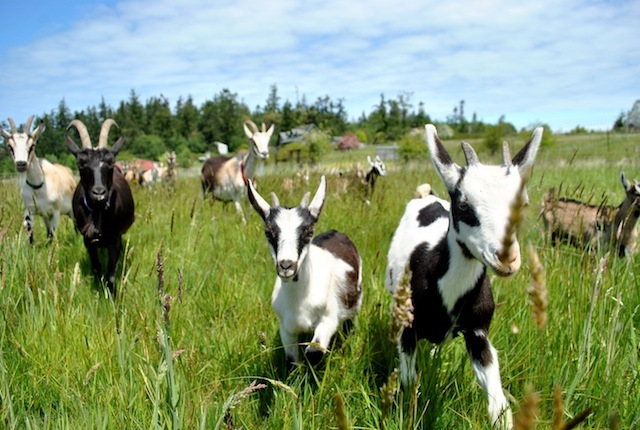 Mystery Bay Farm is a small scale, family farm operating on five acres on Marrowstone Island. We have been a WSDA certified Grade A Dairy since the spring of 2009. 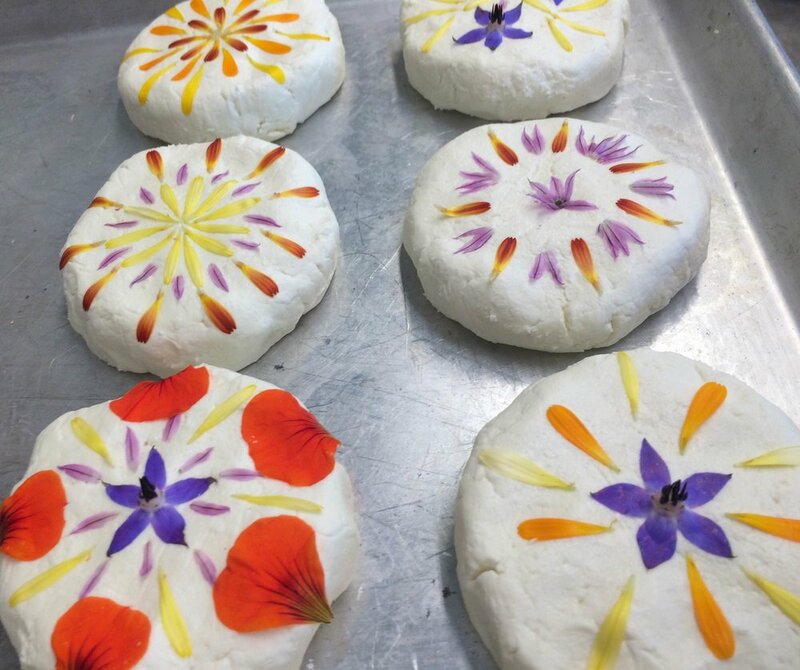 We produce farmstead, goat milk cheeses and yogurt for general sale. Farmstead means we make all of our cheeses and yogurt using only the milk of our animals. In addition to cheese and yogurt, we offer educational farm tours. We offer tours and classes as a way to educate and integrate the community into the farm. As career educators, we feel that there is a need to inform the greater public about where our food comes from and to provide a genuine experience for the growing number of people interested in artisan, non-industrial food production and farming. We came to farming via ecology. Our interest in trying to create a truly sustainable farming system grows from observation of natural systems from which the word 'sustainable: resilient, adaptable, evolving and thus stable', is derived. We believe that farming can be done in an ecologically, economically and socially responsible manner. Seasonally available at the Saturday Port Townsend Farmer’s Market (June -September) or by special order. Great for special events, weddings and parties. Call or email for ordering and pricing information. Guests will learn the basic natural history of goats, our management styles/techniques and see examples of our rotational mixed forage grazing. They will also tour our milking parlor and cheese making facility. The tour is approximately 1 hour long, culminating with a cheese tasting. $40 for up to 4 people, additional person $10 each. Kids under 10 free. Come learn about homestead-style self-sufficiency. Guests will tour the dairy as well as the greater homestead where they will explore examples of: perennial silvapastures, nutrient management, farm and infrastructure design and layout, water catchment and storage, solar hot water heating, integrated organic gardens and orchards (fruit and nut), creating animal forage and more. Tour is approximately 2 hours and includes full cheese tasting. $100 for 2 people, additional person $20 each. A personalized, hands-on and in depth tour of our production systems from milking to cleaning to cheese making. This tour is appropriate for people interested in a much more detailed exploration of the dairy. 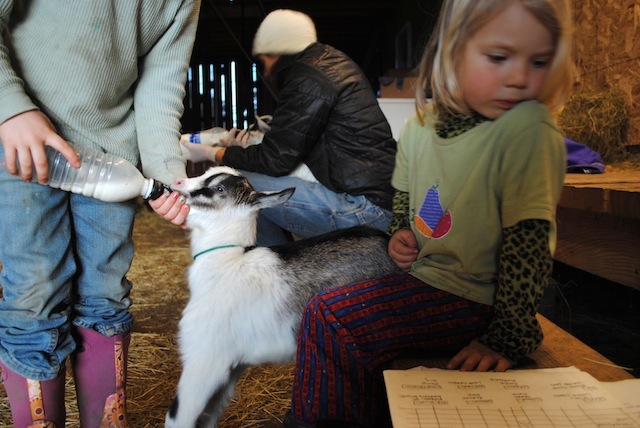 We milk 100% American Alpine dairy goats. They each have been raised on our farm and have names and distinct personalities (come visit and our 9 year old can tell you the line up!). We breed the adults in the fall, which gives us spring kids five months later. We milk between 20 and 25 goats each season. Since our goats 'are what they eat', we judiciously monitor their food. We practice intensive, rotational grazing which utilizes classic grass pasture with brush islands; this mix highlights the natural need for browse in a goat's diet and reduces the dependency on hay during the spring and summer months. In contrast to cows and sheep, goats browse, rather than graze, and cannot get all of their necessary nutrients from a grass-only pasture. When given a choice, goats will eat browse plants, such as blackberry, roses, trees, ivy etc., which are more suited to their digestive system. Grass is consumed, but in a more limited and picky manner. We have established a rotational browsing system that incorporates the established high-quality grass pasture with edges and islands of brush (the native Nootka Rose, hawthorn, blackberry etc.) that can sustain the majority of the goat's food needs for up to eight months of the year. We have begun planting more brush islands within the pastures which include edible fruit trees surrounded by native berries and brush to further diversify our browse, natural habitat and food production. In turn, they provide high quality milk with undertones of our maritime climate. We only substitute their varied pasture with local hay (which we cut during the peak of seasonal protein levels), seaweed and organic grain.